The Western Charm Silver Tone Expandable Bangle Bracelet is the perfect solution for your denium, summer or casual attire. 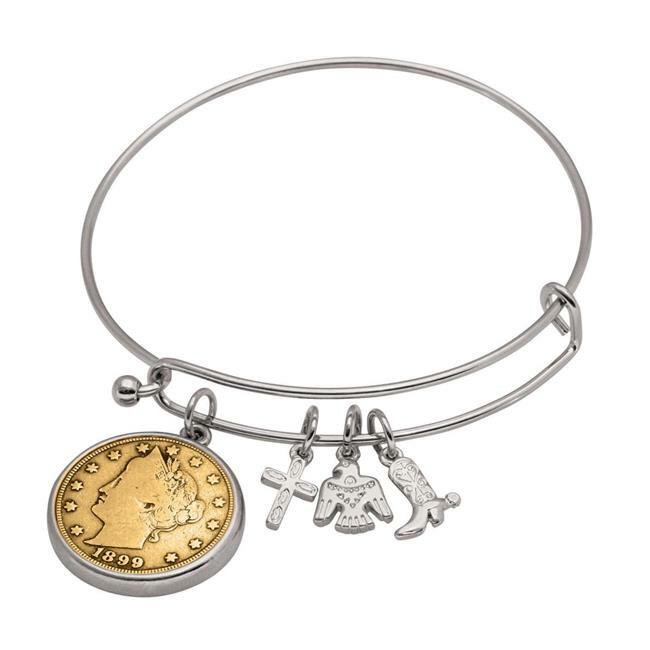 The bracelet features a Gold Layered Liberty Nickel in a silver tone circle bezel and three western style charms, a cross, a cowgirl boot and an eagle. The bangle bracelet expands from 2.5 inches in diameter to 3.5 inches, wide enough to fit most wrist sizes. The charms measure approximately 8 to 10 mm in height. The gold layered nickel set in the silver tone bezel is 0.875 inches by 0.875 inches. The Liberty Nickel was minted from 1892 to 1916 and was designed by Charles E. Barber. A Certificate of Authenticity is included.